India can be pretty full-on at times, so when you find a nice place to relax you usually end up staying for ages… as we did in McLeod Ganj. McLeod Ganj is high in the Indian Himalayas in the mountainous state of Himachal Pradesh. It’s home to the Tibetan government in exile, the Dalai Lama, several thousand Tibetan refugees, and quite a few travellers! We were there for roughly 6 weeks, nearly beating Goa as the place we’ve spent most of the time in India. Hopefully this will give other travellers ideas and Travel Advice about what to do in McLeod Ganj! Things to do and enjoy in Mcleod Ganj! McLeod Ganj’s Tibetan culture equals loads of healthy and hearty Tibetain dishes. Like Thukpa (thin noodles) or Thentuk (square, flat noodles ) in soup, usually with veg or meat. 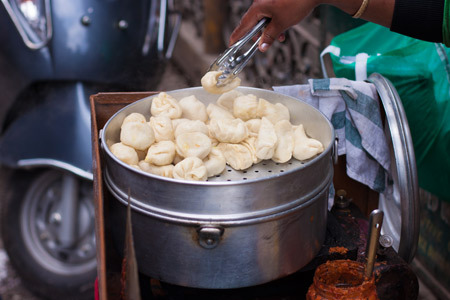 Momo’s are a staple in Tibetan cuisine. Like Chinese dumplings, these are usually stuffed with veg, meat (mutton), potato or a combination! Try the chocolate peanut butter momo’s for a western twist. If you’ve tired of 6-spoons-of-sugar, melt-your-teeth strength Indian chai (milk tea), try some Tibetan butter tea! Probably equally as unhealthy, but it’s a warming drink that hits the spot. It’s buttery, salty, and pretty good! I imagine I’m sat in a tent in on the Tibetan plains every time I have some! McLeod Ganj is up at 2000+metres, so it’s much cooler than the majority of India. It’s also statistically the wettest place in India too, so bare that in mind if you’re passing through McLeod Ganj during monsoon. During our first visit, we were there at the back end of the monsoon and it was pretty bad. Think grey skies and multiple hours of hard rain – a bit dreary. We came back to McLeod Ganj a month later (early October) and the monsoon had past. It was a different place altogether – beautiful blue skies and a very comfortable daytime temperature – but still a bit chilly at night. Bring a jacket or buy a yak wool shawl in town for the evenings! 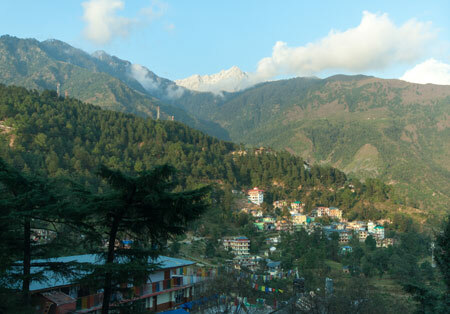 Check out the McLeod Ganj Weathergeek blog for a comprehensive look at the weather and seasons. Practising Tibetan Buddhists come from all over the globe to McLeod Ganj to study, relax, learn Tibetan and to see the Dalai Lama in person doing his teachings. 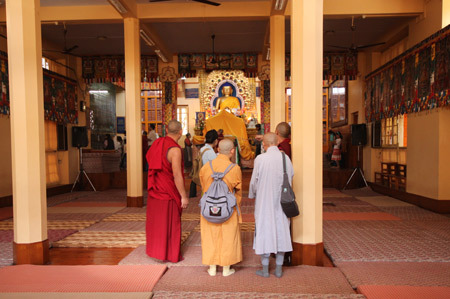 You’ll see monks and nuns walking the streets with their prayer beads, some chanting mantras as they go about their day. 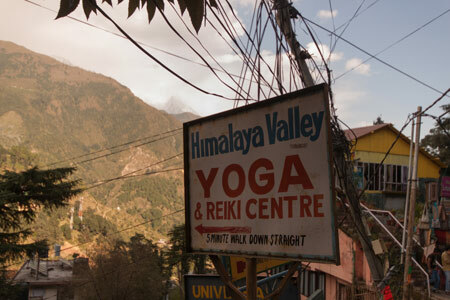 All this makes McLeod Ganj a very chilled and serene place to be. McLeod Ganj has more cafés than you can shake a (erm..) Tibetan thing at! Some of the best coffee we’ve had in India has been from McLeod Ganj’s coffee shops! Most offer free wi-fi and usually have a few food options.. plus some offer vegan cakes for Eloise. Pretty much every direction you look in McLeod Ganj you’re guaranteed a stunning view (not counting the pizza menu at Carpe Diem!). 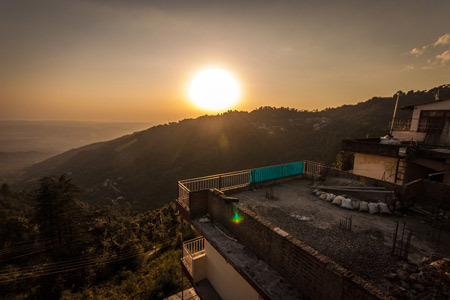 To the south you have the view down over the valley and towards Dharamsala, with stunning sunsets every night over the mountains in the west. To the north, sheer snowy-peaked mountains, daring thrill seeking travellers to try and climb them (take equipment!). Check out the Bhagsu cake! There are several multi-day hikes around the area too, agencies will be able to point you in the right direction and provide gear and equipment. 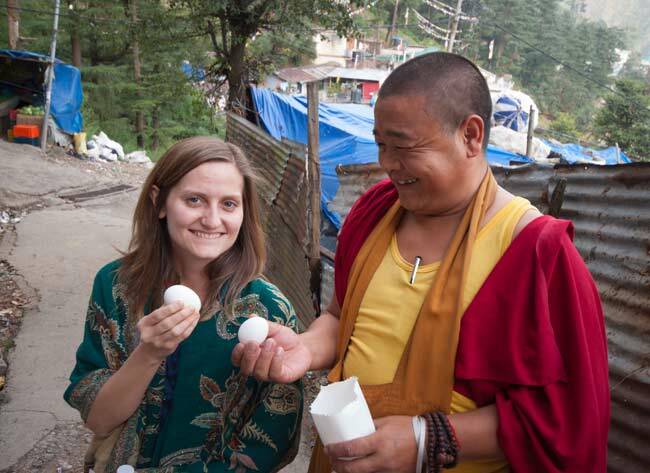 Tibetan refugees make up a large percentage of McLeod Ganj, so naturally there are a lot of NGO’s and charities to help those who need it. The Tibetan government in exile offers care and finances for Refugees arriving from China occupied Tibet who have made the horrendous journey through the Himalayan mountains, over the Tibetan borders to Nepal or India. Most can’t speak Hindi or English, so the Tibetan government provides somewhere for these refugees to live and offers further education. Various NGO’s ask if volunteers can give up an hour of their time to sit and talk with Tibetans, purely as an English speaking exercise. Eloise and I did several classes and really enjoyed them. Usually a topic is decided, and you just chat away. It’s also an interesting insight into Tibetan culture, their country and their lives before they arrived in India. There’s usually no commitment, and there are other voluntary opportunities available. Check out LHA and the Hope Café for more info. We also volunteered at the Rogpa Centre during their weekly ‘Temple baby walk’. Rogpa offers free baby care to Tibetan babies and children from single and lower income families, provided the parent(s) are employed! While the offering of something ‘free and charitable’ in the west is quite common, I think this is quite rare in India. 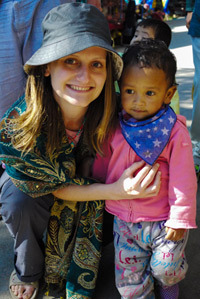 The Friday temple walk is a chance for Rogpa to get together volunteers to take the kids out for a walk down to the main temple. It’s great fun! Check out the (slightly dated) Rogpa website for more details. Whatever you fancy trying, McLeod Ganj probably offers it! It’s easy to find things to pass the time in M.G! There are countless courses available should you want to learn something different during your stay. 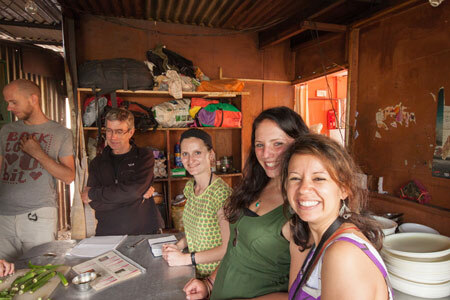 There’s no doubting that we wouldn’t have stayed as long if it wasn’t for our friends we met during our stay – Rachel and Elena. 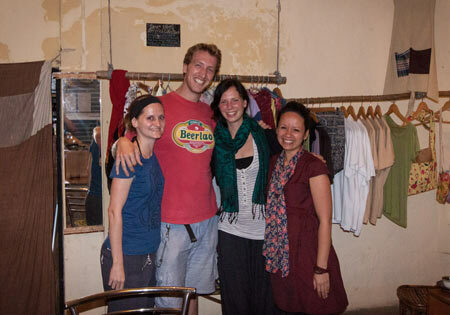 We had such a great time together – café hopping, pizza scoffing, momo munching, beer and rum drinking (never challenge a Tibetan to a Tibetan drinking game) and some volunteering mixed in too! We just wished we could have stayed longer. So that’s 8 reasons why we spent so long in McLeod Ganj! It’s easily done. If you’re travelling northern India, we can highly recommend a visit! If you have any questions about McLeod Ganj, we’d love to hear them! Check Out These Handmade Tibetan Dolls! I’m beginning to start planning a trip here and just have a few questions. Will we need any sort of translator or guide to get around? Do you think 2 weeks is a long time to stay there or are there other places nearby with Tibetan communities? 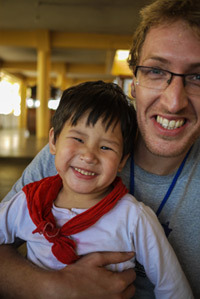 My main interest is being able to spend time with the Tibetan people and hopefully get to know some of them. We just spent 2 weeks in Tibet but we didn’t have an opportunity to stay put for longer than a couple of days. Any recommendations for accommodations?